There’s been a lot of talk lately about Virtual Reality (VR) and Augmented Reality (AR). At Fox & Associates we’ve been watching to see when this technology will enable new or improved products for our clients. The potential is that we’ll have a new way to communicate design proposals (or even create designs) in a much more immersive environment. What follows is our brief introduction to a Google Cardboard headset, along with suggestions for content you might like to try. But first some background – most of these simple headsets are made to a spec called Google Cardboard, and there’s an associated app also called Google Cardboard that introduces you to VR. Please ensure when you insert your phone into the cardboard viewer that it’s secure – perhaps use a bit of tape to stop it sliding out. Stick some headphones on your phone, download the Google Cardboard app, start it up, and follow the instructions. At the point where it asks for a QR code use the one on the side of the headset. Virtual reality is where the computer delivers all of the environment. A 3D space with both vision and sound that could be as simple as a 360 video (try installing the Youtube app, search for “360Video” content and when you’re playing the content, change the settings to View in Cardboard), or as complicated as an interactive video game. 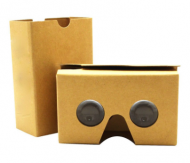 We hope you enjoy experimenting with your Google Cardboard viewer. Just to round things off we need to mention Augmented Reality (AR, or sometimes called Mixed Reality – MR) which is where a computer-generated reality is visible overlaid on the real world. This could be as simple as sitting a virtual block stacking game on the table in front of you (scroll down to find Stack here: Ketchapp games), or making real-world measurements of the room you’re standing in (MeasureKit). A personal favorite combines topo information with the video feed and allows you to identify mountain peaks on the horizon (PeakFinder). We think it’ll be interesting to see how this technology develops, and moves out of the entertainment world into our world of design.